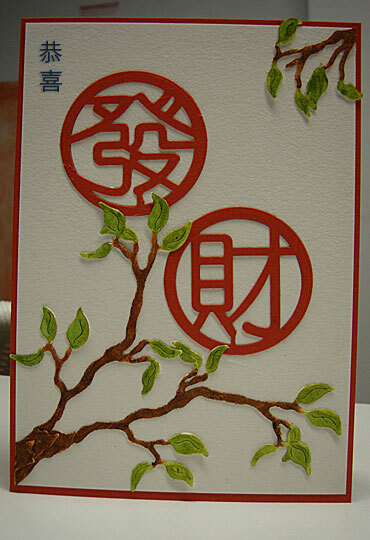 A Gong Xi Fa Cai Chinese New Year greeting card using punch art and die cuts. With the right tools or card making supplies, you can easily make some stunning Chinese New Year greeting cards at home and surprise your relatives and friends this Lunar New Year. Just follow the step by step instructions given below to make this simple Lunar New Year greeting card. red color cardstock - 8.25" x 6"
cream color cardstock - 5.75" x 4"
score and fold red card stock to make a base card for this chinese greeting. copy and save chinese characters 'gong xi' to your harddisk. 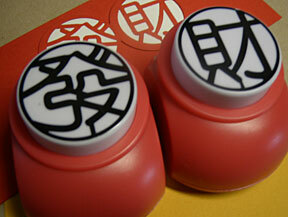 print the chinese characters on the cream card - position the words on the top left. paint the die cut branches with the watercolors. 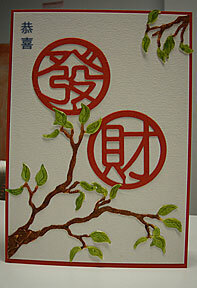 arrange die cuts branches and the chinese characters 'fa' and 'cai' on cream card. apply glue and attach to cream card. apply glue on back of cream card and layer on top of red card front. glue to front of red base card. That's it! Just add a message inside the card, sign and placed inside an envelope and your Chinese New Year greeting card to send to wish someone 'Gong Xi Fa Cai' is ready for posting. Click here to learn how to make this Lunar New Year card.